Quantum cycles are the microscopic version of the macroscopic thermodynamic cycles, such as the Carnot cycle or the Otto cycle. The quantum Otto cycle consists of four-strokes, two adiabats and two isochores. 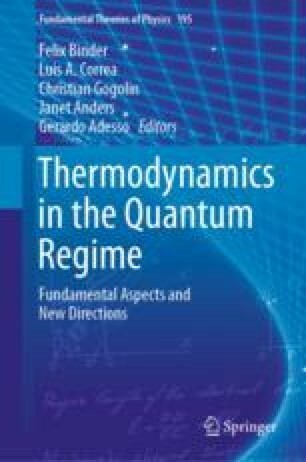 The equations for the dynamics on the adiabats and isochores are derived from first principles and illustrated for a working medium consisting of spins. We review a frictionlike behaviour due to the noncommutability of the external and internal Hamiltonians. The performance of the engine cycle and the refrigerator cycle are illustrated using a simple model of an ensemble of spin pairs with an effective interaction. Tova Feldmann thanks Prof. Ronnie Kosloff the collaboration for over twenty years, during which Ronnie taught her new ways of thinking in science. Tova Feldmann also thanks Amikam Levy for many interesting conversations. José P. Palao thanks Ronnie Kosloff, Antonia Ruiz and J. Onam González for useful discussions, and acknowledges financial support by the Spanish MINECO (FIS2013-4132-P, FIS2017-82855-P).